Hello friends! Shall we play with some sassy old ladies, and try out a new action card? I think we shall! Stay Golden is such a fun set, and it pairs perfectly with all things tropical! This is a double slider card, and the front is lovely, but pretty unassuming. Then when you pull on the tabs, it kicks it up a few notches! I did make a video showing how to make this card, and it also shows 2 other cards made with the same design, but different papers. Inside Slider Base: cut one at 3-3/8" x 4¼" (8.5 cm x 10.8 cm), create notches in the 3-3/8" (8.5 cm) end, 3/8" in and from each side. 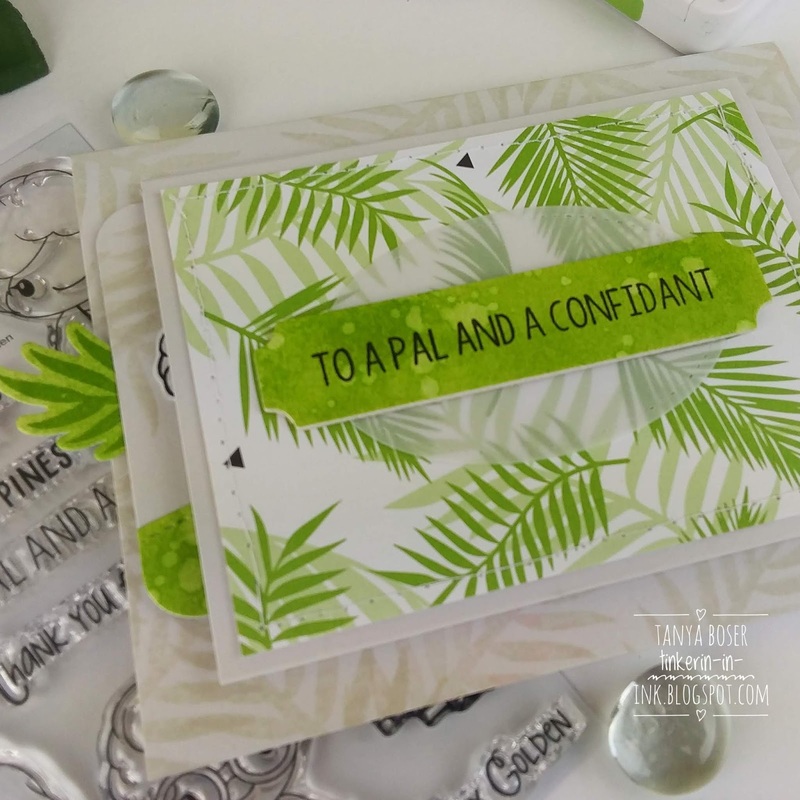 The sentiment on the front is stamped on a piece of white card stock sponged with a bright green ink, then spattered with water. A stitched oval vellum piece is behind the sentiment to add a little more fancy. The sentiment on the inside is just perfect!! Audra from Kindred Stamps did a marvelous job with this set! The leaves on the sides are stamped tone on tone on this very pale gray card stock. And there it is, all put together! I think I have found another favorite interactive card technique. 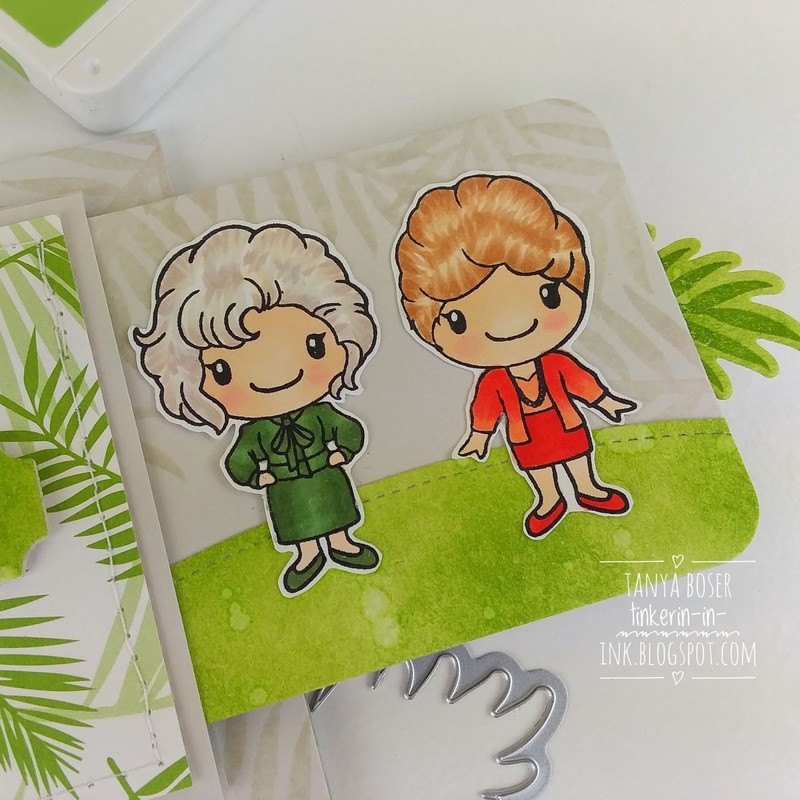 And that there will be quite a few sassy old ladies in my stash of cards. Thank you so much for taking the time to show us how you made the slider card and for sharing your colors! I love this! !